I suppose I should have remembered that the tanks were coming. Someone made a sarcastic comment about rooftop snipers, as everyone else continued to gawk out the windows like children on the morning of Christmas. A man rushed in with his laptop and began fiddling with the television’s HDMI cord. A few weeks prior, I developed an idea to go hostel-hopping. My plan was simple: jump hostel to hostel, interview strangers, document it and create something from all the content. Ultimately, learning to play tourist in Moscow in the process. During my hunt, I found a hostel located on Tverskaya Street, the main street downtown, called Vagabond. The prices were affordable with various room options ranging from $13 to $20 a night (depending on room size and demand). The pictures and reviews online seemed promising, so I decided to give it a shot. I packed my bag, jumped on a train, and an hour later found myself ringing the doorbell of my destination. When I entered, I was greeted by the hostel owner and given a tour. After throwing my things in my room, I went into the common kitchen area where a few people were hanging out. 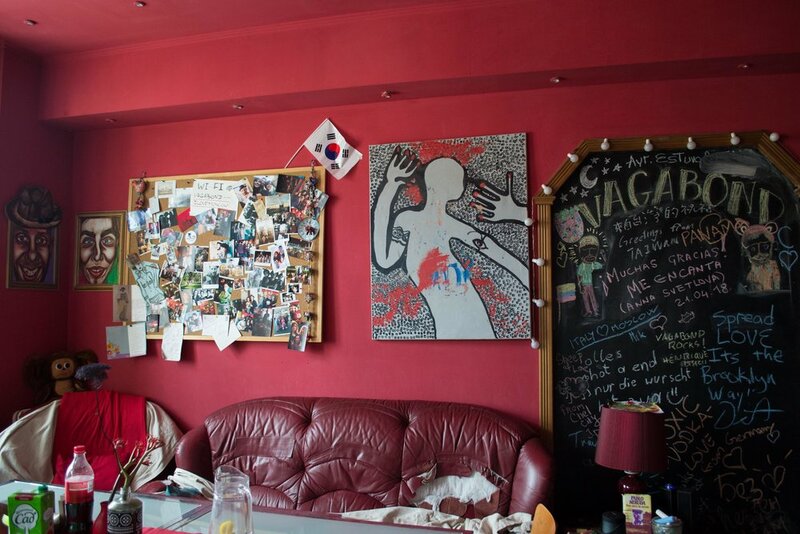 The room was warmed by red walls cluttered with an array of postcards, pictures, and thought-provoking art. On the right side of the room, stood a large glass table. On the table’s opposite sides, were two old, beaten up sofas, and chairs placed at each of the ends. I found the nearest chair, and after being offered a glass of wine by the owner, I began my project (stay tuned as I fail and rediscover hostel booze culture). What started as a personal writing assignment turned into weeks of frequent visits and encounters with old and new faces. Immediately I was thrown back into the culture of zero plans and spontaneous actions all mixed with late nights and partying. As I became a participant in this culture, I watched as my basic intuition was abandoned, and was replaced by the curiosity of where I may be led. I began to say yes to invitations, and I found myself anywhere and everywhere. It led me to have an awkward few beers in one of the Seven Sisters Skyscrapers designed during the Soviet era. Another evening, I found myself sober, people watching at the nightclub GIPSY where older Russian men waltz with hookah. However, one of the best places I stumbled upon during my adventures was the park where the Devil first visited Moscow in Mikhail Bulgakov’s classic novel, "Master and Margarita" (go and read it if you haven’t) while drinking a few glasses of wine. The sounds of rumbling below brought everyone to the windows. Crowds started cheering as tanks began to roll by. A little later, Putin’s face was on the computer screen addressing the Russian people. It was May 9, the day the Nazis were defeated, or also commonly known as Victory Day. Victory Day commemorates those who participated in the Great Patriotic War (as the Russians call it). An estimated 27 million people lost their lives in the Soviet Union during the war, and not a single family came out unscathed. Even 73 years later, people gather in throngs on the street to march to the Red Square. With friends from the hostel, I joined the crowd, and began to march forward. Around me people held ghostly images of loved ones from the war; faces never to be forgotten. We marched forward together, packed like sardines, but in good spirits. Every few minutes someone would yell “Hurrah!” and in sections, the crowd would respond. As I began shouting with the crowd, I was suddenly hit by a wave of bittersweet emotion. In three weeks, I would be leaving Moscow to head back to Atlanta. My period in Russia was ending. After spouts of homesickness and depression, I slowly learned to appreciate Moscow. Through the experiences shared with vagabonds at a hostel, I gained an entirely new view of the city. By playing tourist, I found comfortability. Nine months later and I can honestly say that I love Russia.